As far as rugby players go they don’t come much bigger and better than George Smith. The Wallabies legend is widely regarded as one of the best flankers to have ever graced the game, in a professional career that has spanned almost TWENTY years. 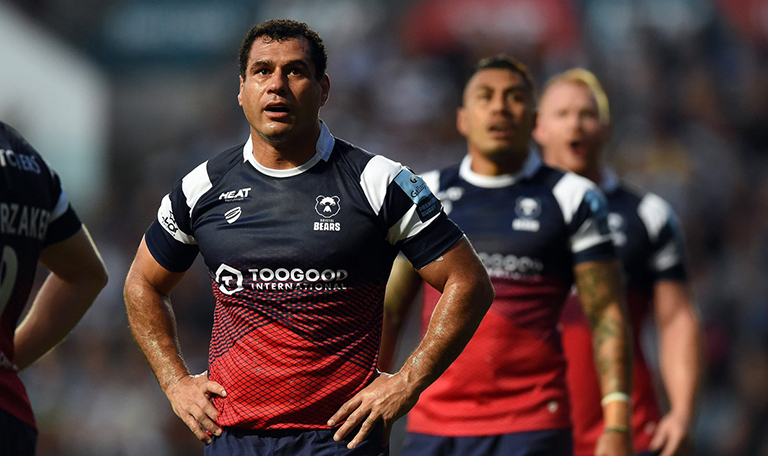 The 38-year-old is still playing at the highest level with Premiership side Bristol Bears and is without doubt one of the greatest rugby minds in the game today, especially when it comes to the breakdown. England head coach Eddie Jones even brought him in last year on a consultancy basis to teach his players some poaching mastery, so it’s pretty safe to say – George Smith knows his sh*t.
So when he appeared before a Premiership Rugby panel yesterday following a controversial red card for a hit on Saracens’ Jackson Wray, Smith gave the committee a lesson in rugby. While pleading his case, the Australian went as far as demonstrating the tackle, explaining why the position of the ball was so important, and how the tackle developed, resulting in a hit that looked a lot worse that it really was, and not worthy of a red. How many players can say they went to a disciplinary hearing and ended up give the panel a few lessons in rugby? What an absolute legend. Hat-tip to Telegraph rugby writer Charlie Morgan for pointing this out. George Smith rocking up to his own disciplinary and getting off after giving a tackling clinic is just about peak alpha.